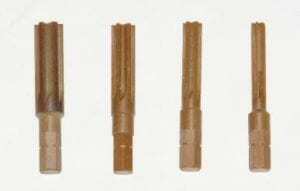 The EnduroSharp™ Torlon® Adhesive Reamer (TAR) tools are non-metallic, multi-fluted, straight-walled reamers. They are used to remove non-metallic debris such as cured sealants and adhesives from fastener and bushing holes in metallic or composite structures without damaging the structures. Available in four different sizes, the reamers have a hex drive mounting feature, allowing it to be used with low RPM battery-powered screwdrivers (200 rpm or less), ratcheting screwdrivers or the EnduroSharp Ratcheting T-Handle with Keyless Chuck.